Prince Albert, lies on the southern edge of the Great Karoo, nestling under the magnificent Swartberg Mountains. 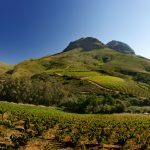 The Swartberg mountain range are a World Heritage site, part of the Cape Floral Kingdom, boasting the greatest number of plant species, particularly fynbos, in the world. A brief stay of two days allowed us to discover the following places of interest. Good country cooking served by friendly locals. Homemade lemonade with a touch of mint. Take your own wine, with no corkage fee. Plus fee internet access. World famous apple pie, though we never got to taste it. 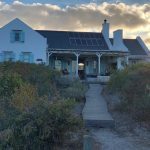 Vergeet-my-Niet lives up to its name and is a comfortable self-catering cottage which offers accommodation for a family of four or ideally two couples. The lounge and kitchen lead onto a grassed garden complete with hammock, comfortable rustic outdoor seating and great braai facilities. This farm is situated about 4 kms on a dirt road outside Prince Albert, under new management and has great potential. On offer are olive tastings and light lunches. Situated more centrally in Hope Street, were father and son team of Fred and Hein Badenhorst realized olives were a natural fit for the unique micro climate. The extra virgin olive comes in a striking yellow tin and has great peppery aftertaste. Also available at Woolworths. 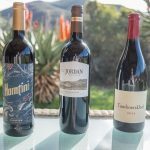 Hein and his cousin, Adi Badenhorst also produce wine under the AA Badenhorst Wines and Secateurs label in the Swartland appellation. 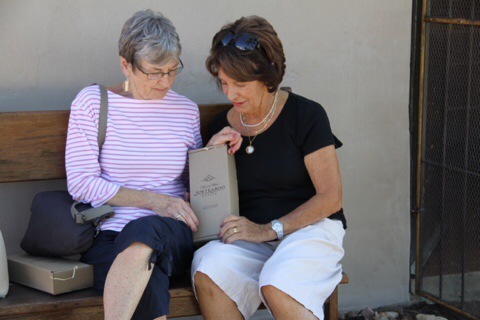 A must visit is the SoetKaroo Wine Estate, which is a hectare town farm situated in the middle of Prince Albert, opposite the Swartberg Hotel and run by Susan and Herman Perold. We met the energetic and passionate winemaker, Susan, who has converted the garage into a cellar & here she handcrafts the four cultivars grown on the piece of land at the back of their Cape Dutch cottage, a Red Muscat d’Alexandrie, Red Muscat de Frontignan, Petit Verdot and Touriga Nacional. 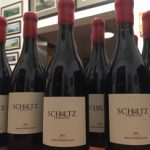 Loved the Suzie se Soetez, which is a blend of ‘left overs’ from all of the above – cheeky and delicious, with no two vintages ever tasting the same! Leaving Prince Albert on the way to Meiringspoort you come across three wine farms. The two we visited were Bergwater and Fernskloof. 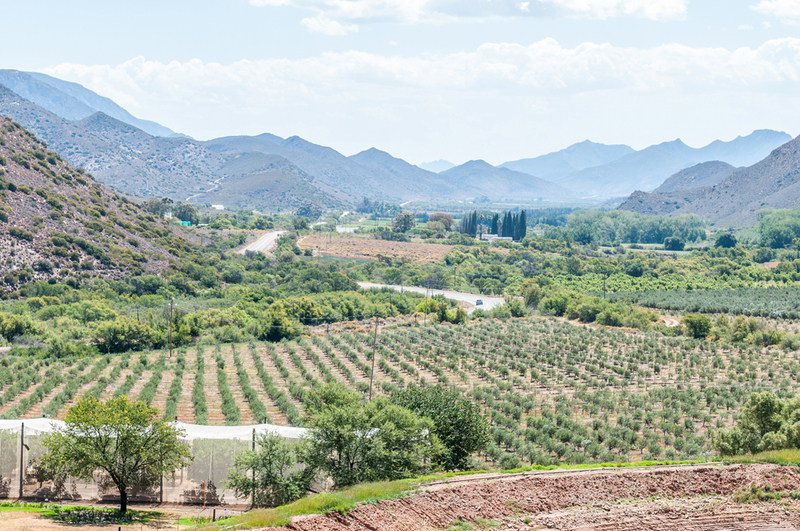 The largest of the wine farms in the Great Karoo, Bergwater is situated in the Prince Albert Valley, the second farm on the outside Prince Albert. Known internationally for their wines having them served in the business class of KLM and also at the royal wedding of Prince Albert of Monaco. The Shiraz reserve was the best on offer, with good red fruits. 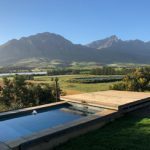 Beautifully situated luxury suites and a self-catering cottage on this working farm, 10 kms outside Ladismith, Mymering is nestled in the Dwarsrivier valley amongst wine lands and the towering Towerkop Mountains. walking, hiking and mountain biking trails, which allows one to explore and enjoy the many beauties of the farm. The option of accommodation packages are bed and breakfast, self-catering or the choice of a sumptuous three course dinner served on the terrace in candle light and hosted by Andy and Penny. The dinner is prepared by Penny and her staff and it doesn’t get better than that outside of Cape Town. Penny’s cookbook is expected out in September.